Please welcome guest-blogger Sonja Jefferson to Trust Matters today. She’s founder of Valuable Content consulting firm, and author of the Valuable Content Marketing book. I have high regard for what she does, and think you’ll enjoy this. I’d like to make a distinction. ‘Content’ is the words on the page you are reading. It’s the copy on your website, the blog you posted last night, the videos, images and tweets that you share. When we’re talking about content we just mean words, knowledge and information. What lifts a piece of content above all the noise is the value it has to the person reading it. The term we use is ‘valuable content’. Valuable content is supercharged content – words, knowledge and information shaped for your particular audience. It is content with a bigger purpose, useful information created for a niche; quality collateral that really hits the mark. Valuable content is meaningful content and it will help you build trust at every step of the buying process. Here is how I’ve seen it make a difference to consultants and professional advisors along the long road to a sale. Growing awareness: Online or off, the right content will help you be found. Search engines reward valuable content. Just like your prospects, the Google algorithm is getting better and better at recognizing and blocking spam. But if you regularly share useful, relevant content in your blog articles and social media updates you’ll build your reputation and network, and rank as a helpful expert in your niche. Generating interest: They’ve found your website, do they find something relevant and useful when they get there? Most websites and marketing communications are nothing more than self-oriented propaganda. We follow the 80/20 rule of thumb: aim for 80% valuable content and no more than 20% promotion. Pack your website full of engaging content, just for them. The key is to focus on the client and their issues: how-to articles and valuable guides are far more engaging than a brochure. Proving your expertise and motivating them to buy: Buyers are more likely to want to work with thought leaders and experts in a given field, and your published content helps you earn that title and builds trust in what you can do. When you’re up against a competitor, valuable content gives you an edge. When clients see your passion and expertise shining through, you gain an added level of credibility. To convert all this good will into action is often a matter of good timing. Not everyone will be ready to buy straight away, so motivate them to keep in contact with you – connecting on social media and a simple email newsletter once a month will keep you front of mind. Making it real and deepening the connection: Turning the spark of interest into a burning desire to meet means engaging prospects on a deeper level. 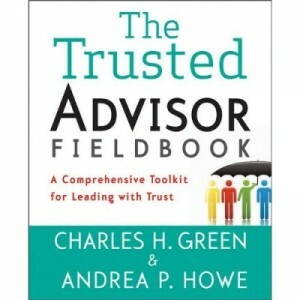 Online tools like the Trusted Advisor Trust Quotient Assessment are a great way of helping potential clients experience the way you could help them; valuable in their own right. Webinars are another way to let potential clients see you in action. Hearing your voice, seeing you answer questions in real time make the benefits of your services come alive. Put the customer and his challenges at the centre of your world, and show them clearly not just how you help someone like them, but how your insights and experience could directly benefit them, for real. Marketing with content is more than just a lead generation activity. It’s an invaluable tool right through the process from first touch to long-term relationship. Help your buyers along their sales journey with valuable content. Provide genuinely useful information at each stage of process – from ‘just looking’ to ‘just about to buy, big time’. Use it wisely and people will get to know, like, and trust you, and remember you when the time comes to buy.